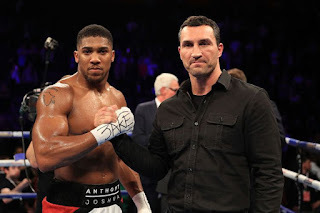 Nigerian-born British heavyweight boxer Anthony Oluwafemi Joshua ahead of his Saturday night world title showdown against Wladimir Klitschko feels certain experience will count for nothing during the bout, Completesportsnigeria.com reports. Joshua will face Klitschko at the Wembly Stadium in the third defence of his (Joshua's) International Boxing Federation title. "We talk about experience but when I I fought blokes with less experience I prepared as if it was a world championship fight," Joshua said during Thursday's press conference. "I've been preparing from the beginning on this. I have never underestimated an opponent. Through mistakes I have learned. "April 29th is the next step on the road to greatness." Joshua has had only 18 professional fights – 50 fewer than his opponent on Saturday night – and has fought in just 44 professional rounds. Klitschko has surpassed that in his last five fights alone.